Reflective play a part in reducing heat flow into the roof space. 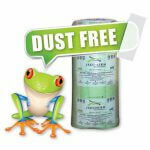 As a result the Raden Shield Double sided when installed correctly will reduce heat flow into the roof space. 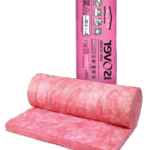 In fact, heat is enters the roof space through conduction, convection and radiation. 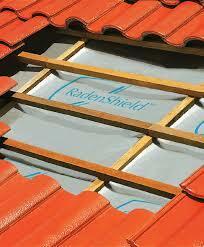 Therefore having a layer of Raden Shield foil installed correctly with a cavity space between roofing and the foil. Ideally the space of 38mm must be available between roof and foil. 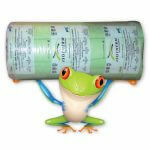 Fortunately Raden Shield Double Sided Price is affordable as the rolls have a 45mtrs2 coverage. R-value of the Double Sided Radian Shield : 1.1 Down R-value only. 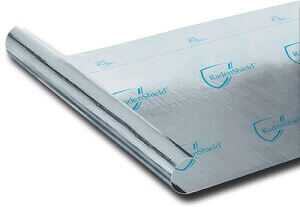 Radenshield Foil Reduces heat flow into the roof space by reflecting heat back. When installing Raden Shield Foils remember foil is only able to help in the summer months to reduce temperature in the roof space. However with Roof Insulation installed directly on the ceiling space this will in no way improve the winter benefit as the foil has a down R-value covering Roof Space. As a result there will be a slight improvement in temperature on hot summer days. 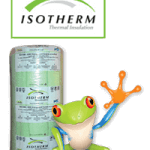 Improves temperature in the roof space. 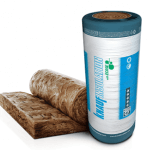 Improves Summer benefit of Roofing Insulation. Unfortunately Raden Shield Single sided will not help in winter as an up R-value is needed. Fortunately this will be covered by the Roofing Insulation Installed. 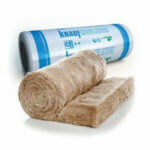 Read more on roof insulation and the benefits of the correct insulation. 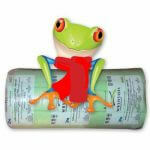 For the best Radian Shield Double sided price give us a call.